At The Golf Learning Centers our goal is simple, to help you develop a passion for the game of golf and have fun doing it. Whether you are playing golf for the first time or an avid player simply looking to shave off a few strokes, we have a variety of programs and instructors to suite any need. Lessons are available in multiple locations and each has their own unique specialty. To view program details and contact information use the course links below. If you've never played golf, this lesson series is for you. You'll learn fundamentals for full swing, chipping and putting...plus golf etiquette, terminology, rules and on-course skills. Designed for the novice golfer or graduate of The Front Nine, this comprehensive program focuses on further developing swing and short game fundamentals. You'll work on swing technique, short game skills and strategy both on and off the course…and learn how to practice effectively to take your game to the next level. We'll analyze your swing and work on short game technique on the driving range. Then we'll take your skills to the course and tie in strategy to help make you a competitive golfer. Enjoy advanced skill development with a teaching professional to hone your skills. Your individual coaching program will perfect your swing and teach you new strategies to assist you in the pursuit of par. These supervised practice sessions on the range allow you to work on your swing technique with an instructor on-hand to give advice and offer swing tips. *This session is included in Tee It Up programs 1, 2 & 3. Play with the Pro sessions will help you make a smooth transition from the practice environment to the golf course. Each session begins with a supervised 30-minute warm-up session followed by discounted golf with a teaching professional. Our pros will play with you to provide tips and support. *This session is included in Tee It Up programs 1, 2 & 3. To get more information, click on a specific course's "Program Details." The Golf Learning Centers, would like to introduce your company to our Corporate Discount Program. This offer allows your company to receive a special rate for adult group lessons. The offer is good for your employees, their family members and friends. There is no cost whatsoever to your company. Deciding to participate is simple. All we ask is that you post our offer where other discounts are displayed. We can provide electronic copy for your internal web site or printed flyers for posting in break rooms if needed. 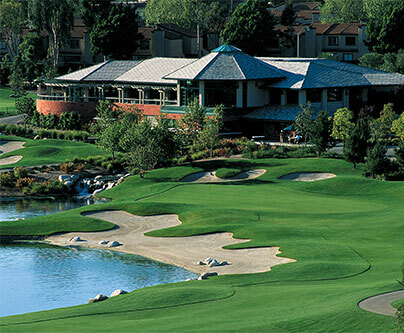 – 5 FREE rounds of golf at one of the Learning Center properties near you! The Golf Learning Centers participate in many Health and Vendor Fairs each year bringing a FUN and INTERACTIVE booth to your event. We offer door prizes or will host our own raffle drawing for free clinics or lessons, rounds of golf or merchandise*. *Each Learning Center will inform you of what their raffle or door prize will be prior to the event if needed. We can hold a special day for the employees and their family members to come out and experience the game of golf together. You can work with the Director of Instruction at the property nearest you to design a day that fits your needs. On Site Golf Classes or Clinics - We Bring Golf To You! Our travel staff will bring all the equipment, targets, foam balls (for safety), and FUN right to your campus! Depending on your employee demographics and interests, we provide either 'Golf Classes', that start on-campus and move to our courses OR "On-Campus Only" clinics. We'll also offer a FREE Golf Day to get everyone excited, meet the instructors and get more information about the upcoming Classes or Clinics. We provide mats to hit from or if your site has anything from a grass field to a grass strip, we can use that too! No site is too small! If your site has them, we even use large Conference Rooms! *This session is included in Tee It Up programs 1, 2 & 3. Please contact Kim Stevens at kstevens@americangolf.com / (510) 589-1644 to set up your company with one of our Learning Center’s booths for your next Corporate Event. The Golf Learning Center’s Junior Academy teaches juniors the game of golf in a fun, safe environment. Designed to let juniors progress at their own pace, the unique curriculum combines both golf skills and life skills. They’ll learn technique, rules, etiquette, strategy and the Six Pillars of Character as developed by CHARACTER COUNTS! The Junior Academy is open to all abilities and caters to ages 5-17. Included in every Academy are either eight hour lessons OR four 1 hour lessons, with clubs and balls provided onsite. Eight levels of instruction and a graduate program provide the perfect opportunity for junior of all abilities to develop the skills and build character one swing at a time. After students complete Levels 1-8, they will attend a graduation ceremony and become a Junior Academy Graduate. They are then eligible for the Graduate Program, which is designed to develop the competitive junior golfer. Graduate students will enjoy a variety of programs including Practice with the Pro Sessions where they learn to develop effective practice skills and Play with the Pro Sessions that allow them to play on the course with an instructor. They’ll also participate in competitive events and attend seminars and clinics. We are proud to offer weeklong golf camps during summer, winter and spring breaks. Our PGA and LPGA professionals deliver first-rate instruction for boys and girls of all skill levels from ages 7-15. Full day camps provide three hours of instruction, lunch and nine holes of golf each day. Half-day camps treat campers to three hours of instruction each day. *To get more information, click on a specific course's "Program Details". Our Junior Summer camps provide an opportunity for young athletes to experience the wonders of golf in a fun and positive environment. These week long commuter camps are designed to create interest and foster development in beginners and intermediate golfers. For three hours each morning, campers sharpen their skills under the watchful eye of our Nike Staff, made up of PGA Professionals and collegiate players. In the afternoon for the full day campers, they take their newly acquired skills to the first tee for nine holes with staff on-hand. Instruction: practice on skills and fundamentals, grip, stance, posture, pitching, putting, bunker play and full swing. Full day campers only, half day campers depart. Course play with staff on-hand(nine holes). Staff provide instruction and guidance on club selection, course management, rules & etiquette. * Camp hours will vary by location. Please request an individual camp brochure or visit www.ussportscamps.com for specifics on each location.